BHUBANESWAR: Despite political stability for past around two decades, Odisha continues to remain among the bottom three states on quality of governance, a latest survey of think-tank Public Affairs Centre (PAC), Bengaluru shows. The PAC’s public affairs index (PAI) published on Friday ranks the state 16th, just above Jharkhand (17th) and Bihar (18th), among the 18 large states. The state comes 27th if all Indian 30 states are considered together. Kerala tops the list. The state’s rank was 15th among 17 large states in 2016 when Telangana was not considered a separate state. So, the state’s position effectively remains the same third from bottom. The overall rank continues to be 27th this time too, raising a question mark on governance of the Naveen Patnaik regime, which is in power for fourth term in a row since 2000. The PAC has measured the states on 11 various criteria of governance. Odisha has been ranked the last (30th) in crime and law and order, slipping from its 23rd position last year. The survey says it has considered rapes, murders, dowry and custodial deaths, police firing, police personnel per 10 lakh population and percentage of women police among the total cops in preparing the index. The state witnessed 2144 rapes and 1328 murders in 2016. “As the minister in-charge of home department, Naveen is responsible for law and order, an area in which the state is on the bottom among all Indian states. It’s deplorable,” said leader of opposition Narasingha Mishra. The state also fared badly in delivery of justice (ranked 26th) in which factors such as pendency of court cases, number of under-trials and vacancies in courts were considered. More than 12 lakh cases are pending in various courts in the state including around 1.68 lakh cases in the Orissa high court, official sources said. BJP spokesperson Sajjan Sharma said the survey only reflect the BJP’s oft repeated allegation of total governance collapse in the state. BJD spokesperson Samir Ranjan Dash said irrespective of the findings of the survey, the governance in Odisha under Naveen has emerged as a model for others. Many schemes of Odisha such as Mamata, a direct cash benefit scheme for pregnant women was replicated by the Centre. Many other states have opened subsidized cooked meal outlets following Odisha. “I don’t think governance here is bad. Except for Maoists problem, I don’t think the law and order is overall bad,” Dash said. I guess Karabara babu has hit the right target. 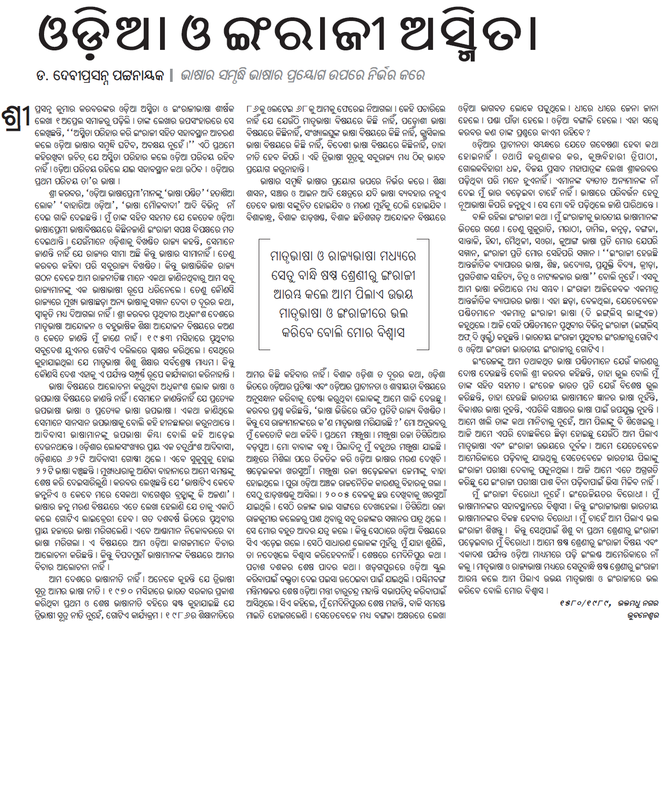 While I agree with some of the points raised by Dr. Patnaik; like his previous articles this article is also very emotional. -It is worth noting that, now he is preaching about dialect and language. Now, Dr. Patnaik says, each language is a dialect and each dialect is a language. If this is the case, why there is a Kosli language phobia? -He writes mother tongue should be the medium of instruction in the primary school level. In this context, will Kosli language be the medium of instruction in the western Odisha? -First he says, he is not against English and then he says he is opposed to the learning of English language from the first standard. Here, Dr Patnaik is talking like oxymoron. He is self contradicting. In my view, the kids should practice English, Hindi and mother tongue from the first standard itself. Some Shishu Mandir kids are doing that. So that, later they will not pronounce Kyat for Cat, Ryat for Rat, Fiyat for Fat etc etc. Learning a language is much easier in the childhood. Why should kids wait until 6th standard to learn Hindi and English? Just because Dr Patnaik learned English from 6th standard that does not mean all the kids will follow him. This is typical language fundamentalist thinking. In the past decades many things have changed. Therefore, it is not a good idea to impose the age-old thinking on Face book kids. 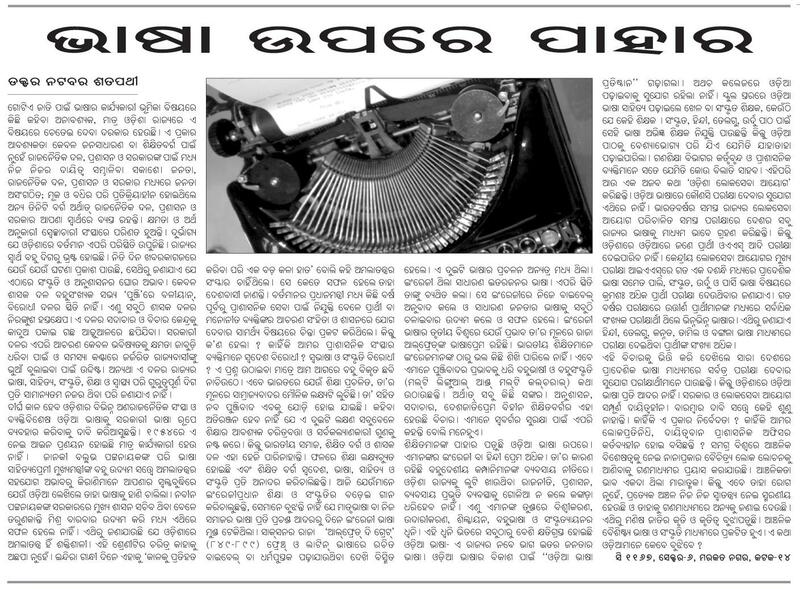 I am surprised by this writing (See the following report from the Sambad). Educated people are speaking and writing in Hindi and English because these are global languages. Learning Hindi and English will get them a job. Odia MPs can not debate in parliament because of their poor command in Hindi and English. There is no harm in learning Hindi and English. It seems Natabara babu is worried because of globalization. May I ask, is Natabara babu teaching his children only in Odia? It may hurt people like Natabara babu; but in my opinion inIndiaevery state should make Hindi and English compulsory along with their state language.